Dysfunction Junction chronicles the most forlorn, baffling, and wonderful crossroads of our fair city. Ben Ball is a transportation nerd in his spare time. He lives in LeDroit Park. Ben previously wrote about The Florida/Rhode Island/New Jersey Triangle. When my aunt from California comes to visit, I derive a wicked sense of pleasure from making her drive through the circles. I just love her white-knuckle grip on the steering wheel and breathless yelps (“BENJAMIN!!!!”). Still, who can blame her? Driving, walking, or biking through the city’s thirty-four circles is baffling. Those of us who have lived abroad know that traffic circles can be beneficial when everyone knows what to do. But the confusing multiplicity of traffic patterns in DC’s circles makes that impossible. If the DC DMV can’t even bother to codify the rules for traffic circles, then how will people like my aunt know what to do? Type #1: Proper Roundabout. These are traditional traffic circles. Cars enter and exit the circle freely, yielding to traffic before entering. In DC, most of these are smaller circles like Sheridan Circle and Anna J. Cooper Circle. Advantage: Traffic flows freely. Disadvantage: Pedestrian access to the circle can be perilous or non-existent. Type #2: Roundabouts with stoplights. Some of these (like Thomas Circle and Scott Circle) are glorified intersections, with underpasses so cars can avoid the insanity of stopping on a circle altogether. 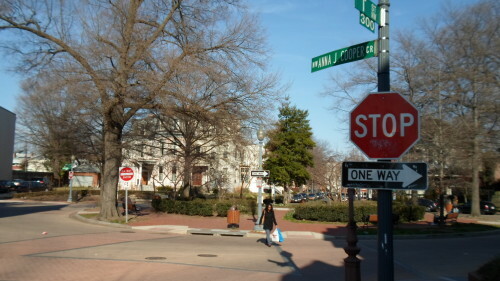 Others (like Logan Circle) may have originally been proper roundabouts, but have been converted in the interest of pedestrian safety or access to the center of the circle. Advantage: Pedestrians can walk through the circle, in theory. Disadvantage: Cars have to stop on the way in, on the circle itself, and sometimes on the way out. Type #3: You call this a %&*$# circle? Dupont Circle really takes the cake here. It’s bad enough that there are separated inner and outer lanes, but those two lanes actually cross on purpose at several points. 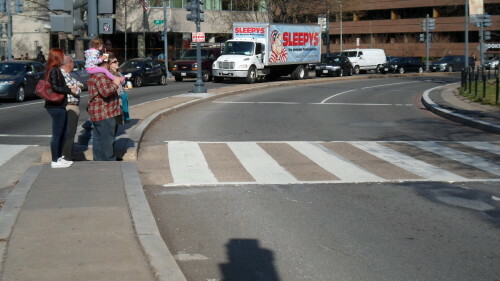 Theoretically this traffic pattern is designed to protect pedestrians, but how many times have you been stuck between lanes of traffic on that tiny little concrete strip, waiting for the signal to change? Ward Circle also has a strange inner/outer loop thing going, with the result that both pedestrians and drivers have no idea what’s going on. Biking through either of these circles? Don’t get me started. Advantage: Car horn and air bag manufacturers win! Disadvantage: Car horn and air bag manufacturers win! If it was up to me, all the circles in DC would be proper roundabouts. (Not “racetracks”.) At least the rules would be consistent. But the first thing we have to do is get rid of those awful flashing yellow arrows. Y’know what means go? Green. Only people who have driven through DC before might know that ten seconds of flashing yellow arrow is the only chance you have to get on a circle. The other 99.9% of humanity is going to wait for a green arrow, which is totally logical. (Someone actually researched this!) Those poor drivers from Poughkeepsie get honked at, then sheepishly inch into the circle, then drive really slowly because they’re terrified by this bizarro traffic nightmare.